It has been an interesting re-entry these past 9 months and the idea of an epilogue has slowly been swimming around my head. I think I have enough perspective now to get something on paper ….. but this post is not yet it. No, this post is about something a bit more emotional for me. I received an email a few weeks ago from my fellow travelers, and in it was news that Peace Corps Baba is very sick. Liver cancer sick. Not a good turn of events in anyone’s life, but even less so for someone in Mali. You may remember Peace Corps Baba from earlier in my blog? I measured his building with a piece of knotted twine and a tailor’s tape; my helpers a couple of smiling children. Since then, we have finished the design and he has actually started the renovation of the building (pretty amazing given the internal turmoil in Mali at the moment!). But … Peace Corps is like that. He is a bit of a force of nature; one walking in joy and a smile perpetually on his face. I am not sure there is any one I have met in my life that better encapsulates the idea of being present in the world. So …. here is this incredible ambassador of West Africa being laid low. The purpose of this post is rather simple. It is for me to ask for support in any way we can give it. Money, prayers, thoughts of good energy …. all are helpful and will be well received. Its very strange doing this, I’ve never asked for help in a public setting. This man is special, however, and he is well worth any discomfort I have to put this out for the world. I’ve attached a link to a website that is taking donations, although I think the time period is over tomorrow. I’ve also included an email link for the good folks on the Ko-Falen board who are friends of Peace Corps Baba’s and who would be happy to receive donations and well wishes for him. They will pass them all on to his family. And here is a cut and paste from the indiegogo site that tells you a little more about Peace Corps Baba and what we are trying to do. Help us raise funds for Baba’s urgently needed surgery, scheduled for November 12 in France. Our dear friend, Oumar Cisse, known to most of the world as Peace Corps Baba, needs our help. Baba makes his living as an art merchant, living in Mopti, Mali. He is an ambassador for Mail, traveling to neighboring countries, the US and Europe, selling ethnic jewelry and textiles of the many artisans of his country, and in the process supports hundreds of fellow Malians and their families. Baba’s life’s work has always been more than selling jewelry, beads and textiles. It is about serving people – uplifting, mentoring, inspiring, providing opportunity to the people of his area of the world. He is the selfless friend to the young and old who work with him, his neighbors, to travelers who never forget him, to fellow exporters and importers. He is a legend throughout West Africa and a mention of him elicits immediate respect. There is no wonder why the Peace Corps honored him with his title of Peace Corps Baba. Peace Corps Baba never asks for anything in return for all that he does. But now, he needs help. A couple weeks ago he was diagnosed liver cancer requiring medical attention immediately. His surgery, which will be done in France, has been delayed until 55,000 Euro can be raised. Recovery and treatment for this will be costly as well. The need for this funding is very urgent! Please join those of us who know and love him by donating what you can. In addition to your contributions, we need you to pass this request on to people in your network, your face book friends, your blogs and tweets. Many small donations will make it so we can reach or exceed our goal of raising $10k by October 24. 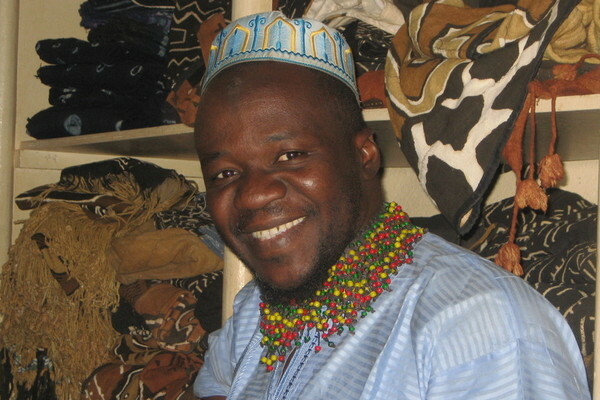 As a young man he worked as a language instructor to new Mali Peace Corps volunteers, and was encouraged by them to build a business out of the beaded jewelry he created. Over the past 30 years he has returned the benefits he received from PCV several hundred fold. His selfless existence is in service of his people, his West African country, and the friends he has made from around the world. He makes sure hundreds of Malian artisans have work and that Malian exports are known for their traditional origins and quality. He is a peacemaker – the one that people come to solve property, family, and neighborhood disputes. People line up in the evening outside of his home to talk to him asking for money for food for their families and opportunity to succeed – no one leaves without his encouragement and enough food or money to feed their family for the next day. Peace Corps Baba is in love with life and gives of himself every waking hour. He is devoted to his family, a loyal friend, a national treasure and a model for what is right in the world. At a time when Mali is experiencing devastating infrastructure deterioration, he cannot look to his neighbors and friends at home to help. This man is most deserving. With many people providing a donation, we can put a significant dent in the expenses he is accruing to stabilize his health and continue to be the important person he is in the world. And boy did I feel like one today;-) I just needed a good espresso and a croissant and some time hanging in a restaurant. Deidre and I walked out of the neighborhood, grabbed a cab heading towards the heart of Bamako, found a bank with a working ATM (!!!!) and ended up at a French patisserie (remember that this was a French Colony for awhile). The espresso was great and the croissant and triple layer chocolate cake thing (I was greedy) was heavenly. Just sitting in an European style cafe for a few hours was enough to reset the body and get ready for more of the African experience. Walking a block down the road, we came to the Toubab styled grocery store called Le Fourmi (translation, “the ant” …. what a weird name for a grocery store). It reminded me of a small but well-stocked general store with a bit of a modern big box feel. Though the street markets of Africa have blessed me with amazing sights and smells and experiences, wandering around the shelves at this store was relaxed enough to truly take in the more subtle cultural differences between Africa and the West. i.e. the toothpaste they use, the soap that is available, their cleaning supplies and methods. Did you know that there are imported brands of Cocoa Puff knock offs that sell like hot-cakes? Or that one of my favorite brands of single malt scotch can be had at a fraction of the cost of its selling price back in Portland? (Yes Scotty, its a bit of Scotch heaven here). Best of all was that we actually had time to browse and didn’t have to fight off the hucksters. Not that the hucksters are a bad thing. Its actually quite a hoot to wade through them and take in the experience. Just not today.